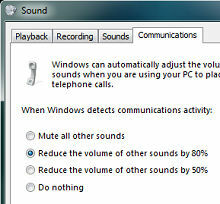 Reduce or mute other sounds on your computer when you receive a call in Lync. A fifth option would be really nice: Pause all other sounds. Microsoft already knows that some people would really like to have that ability, so they actually built it into Windows Media Player. If you are using WMP to play music or watch a video when a call comes in, it automatically pauses until you hang up the call. If you’re using iTunes or QuickTime, you’ll have to pause it manually or just make due with the lower volume. Until recently, if you were to manually pause iTunes or QuickTime or whatever is playing your media during the call, if it is still paused when the call ends, Windows wouldn’t restore it to normal volume. Fortunately Microsoft fixed this, making all of this a much more useful feature. I’d be very interested in hearing from readers on how their favorite media player handles sound and video playback during incoming calls.